NOW Solutions is the next step in the evolution of personal care product. This comprehensive natural line encompasses anti-aging moisturizers and serums, bath and body gels, shampoos and conditioners, oral care, skin care, and essential oils, all of which are formulated with the finest functional ingredients from around the world. NOW Solutions products avoid harsh chemicals and synthetic ingredients in all of our formulations, to provide a more natural product line. Solution: 100% Pure Evening Primrose Oil (EPO) is an all-natural vegetable oil. Used as an herbal treatment for a variety of ailments. EPO contains essential fatty acids (EFA's) that support body tissues, including skin. Combined with zinc, EPO may be helpful for a healthy complexion. Each 1 ml of oil contains 80-100 mg of GLA - an essential fatty acid that can nourish and protect healthy skin cells. 100% Pure Evening Primrose Oil (EPO) is derived from Evening Primrose seeds. This oil is pressed at a low temperature to obtain a pure, natural, virgin oil, without the use of solvents, fillers or preservatives. 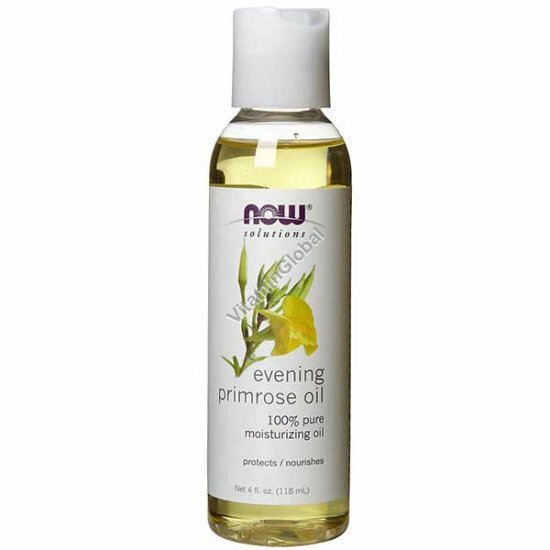 Suggested Use: Massage 100% Pure Evening Primrose Oil gently into the skin to help reduce skin irritation or dryness. 1/8 teaspoon of this oil is approximately equal to one of our 500 mg softgels. Store in cool, dry, dark place.